Howard James was twelve years old when he first met Brian Hancock. Howard lived with his father Alan, mother Olive and sister Rosalind on a small property at Jamberoo, but was a frequent visitor to the Hancock property Teeny Lodge, seventeen kilometres away at Calderwood. Young Howard spent most weekends and school holidays with brothers, Brian and Richard Hancock, who were rapidly establishing their commercial training operation. Howard recognized the innate talents of both horsemen. “They just had a way with horses and were both thorough and meticulous in everything they did”, recalled Howard. “They were perfect role models for any aspiring kid”. By mid-1970’s Howard was totally besotted by the harness horse. He had bloomed under the Hancock tuition and had become very adept in the trotting sulky. 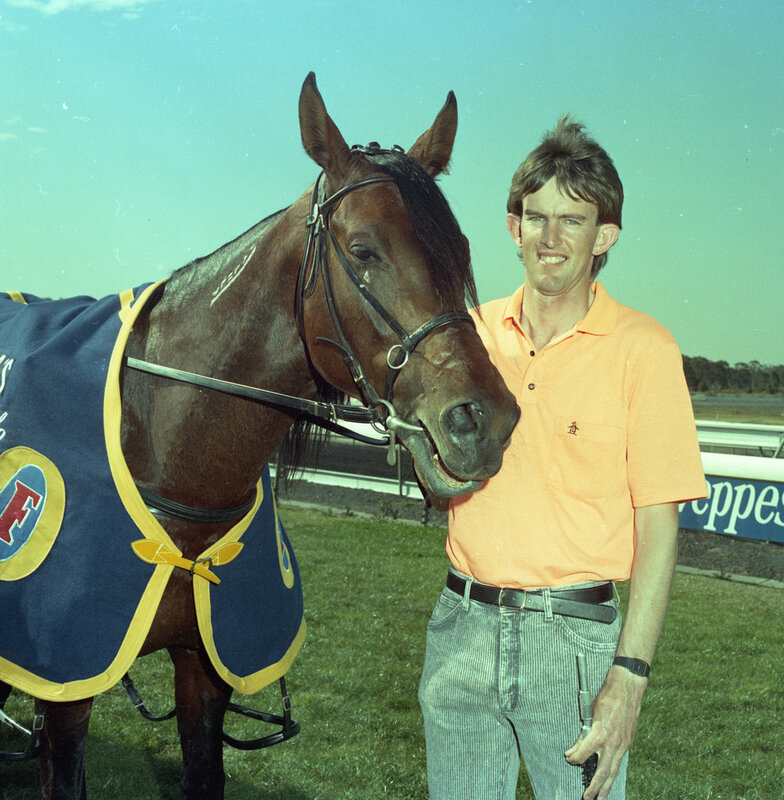 Image courtesy National Trotguide - Howard with his mentor, Brian Hancock, Wyong 1989. He was more than a trifle interested when he heard of a weanling filly which had come up for sale at nearby Dapto. “She was bred by my father’s close friend John Cassar, who had no interest in keeping a filly”, recalled Howard. “She was by the great James Scott from Black Becky who came from a strong family. A quick negotiation and she was mine”. Around two years later, when it was time to get serious with the filly, Howard felt he wasn’t quite ready to train in his own right. With Brian Hancock at the helm, Becky James was soon at the races. “She was a quirky thing with several bad habits and you never knew when you had her in the right zone”, recalled Howard. “But she had enough ability to warrant pushing on, eventually winning eleven or twelve races”. Howard didn’t get to drive Becky James in a race. He was happy for Brian to handle all the training and driving until he was confident enough to drive one of his own horses in a race. He made the decision to accompany his mentor to Queensland for the winter carnival of 1979 and Brian was more than happy for Howard to bring along his own mare Te Anau Miss. This daughter of Thor Hanover provided twenty three year old Howard James with that unforgettable maiden victory in a restricted race at Redcliffe on July 6th of that year. Image courtesy National Trotguide - Howard in his early driving days 1979. For all her idiosyncrasies as a racehorse, Becky James went on to do a respectable job in the breeding barn. Howard trained and drove two of her daughters to win a total of twenty three races - Paula Jay (13) and Kayla Jay (10). Paula Jay emulated her mother’s achievement by winning the Silver Chalice, as well as Sires Stakes Finals at Fairfield and Wyong. Kayla Jay, a daughter of Cash Asset won races at Harold Park and Moonee Valley. For Howard James full time horse training was never an option. He enrolled in a University course immediately after finishing school, emerging three years later with a degree in civil engineering. He was to spend the next thirty five years, most of it in a senior role with the Shellharbour City Council. “They were happy years, productive of many rewarding and satisfying moments”, said Howard. “Obviously I was never able to work more than one or two horses, but they were always there as a diversion”. Brian Hancock always had faith in Howard’s ability as a race driver. “He often had two or three horses in a race and would put me on the horse he felt would suit me best”, said Howard. “I remember one day when he had three runners in a Bulli Free For All - Jikk Adios, Willadios and Out For Glory”, reflected James. “He drove the short priced Jikk Adios and I got up and beat him with Willadios. It happened several times and we still joke about it”. Image courtesy National Trotguide - Howard at the races 1989. It happened on the biggest stage of all at Globe Derby Park in Adelaide on Feb 24th, 1990. Brian had qualified two horses for the Inter Dominion final and had to decide which one he should drive. “He plumped for Weona Chief who had a few tricks and paid me the compliment of asking me to drive old Thorate”, recalled Howard. “I’d driven the horse several times previously and had actually won a few races on him”. To this day Howard shakes his head when he looks back on the way that Grand Final unfolded. “I drew wide on the second row and got caught three deep for a while”, said Howard this week. “I made the decision to go to the fence and drive for luck, little realising that I was going to get a freakish run in the final lap”. At the bell Jane Ellen led with All A Dream on its back. Three back on the fence was Rockleigh Victory, with Thorate four back. Weona Chief was getting a reasonable run one out two back. “I couldn’t believe my eyes at the 400 metres when All A Dream and Rockleigh Victory both had the chance to get off and in a flash I was on the leader’s back”, explained Howard. Thorate came off Jane Ellen’s back at the top of the straight and blasted away to win by 7.5 metres from Gallic Skipper with Weona Chief third. “You’d think Brian would have had mixed feelings, but as we pulled up he was as excited as I was” said the lucky fill in driver. 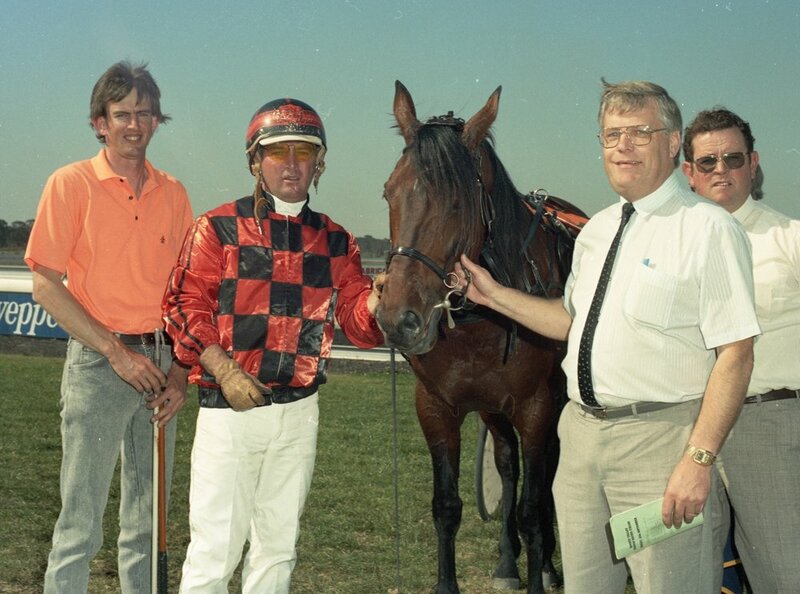 Image courtesy National Trotguide - Howard gets Thorate home Interdominion Grand Final 1990. Thorate who won a whopping seventy races for $1.3 million in prize money later became very difficult around the stables. “He was always a bit on the colty side, but late in his career became almost unmanageable around mares”, recalled Howard. “For his last couple of preparations we actually moved him to my place, where there wasn’t a mare in sight. I used to float him around to Teeny Lodge for trackwork, then bring him straight home again”. With an Inter Dominion under his belt, Howard would have been happy to rest on his laurels. He could never have imagined that seven years later fate would bring him another of harness racing’s greatest prizes. Brian Hancock, who was rarely without a top class horse, had won thirty races with Our Sir Vancelot by the time the Miracle Mile rolled around in 1997. The stallion had already bagged the Adelaide Inter Dom, a Legends Mile, a Truer Memorial and a WA Pacing Cup. Brian was hopeful this horse might be the one to deliver his first Miracle Mile. He was gobsmacked when he received a hefty four week suspension after driving Our Sir Vancelot in the Queensland Pacing Championship. His Miracle Mile dream would have to wait for another year. Howard James had his very first race drive on the son of Vance Hanover in the Newcastle Mile on Nov 15th, 1997 from the inside gate. “It’s the worst place he could have drawn”, lamented Howard. “He was always a bit quirky from the number 1 barrier and galloped in the score up, losing all chance”. The horse went back to Newcastle a week later for the Australian Pacing Championship and was out of position at the start. “He gave them a huge start and wound up fifth in a classy field”, said Howard. “His run was enormous, but with the Mile still a fortnight away Brian was anxious to give him one more run”. The only available race the following week was a Free For All at Parkes, an arduous float trip from Calderwood. There were only three other runners, and there was no betting on the race with Our Sir Vancelot at 1/10. Howard was unable to get away from commitments with Shellharbour City Council, leaving the drive open for Mark Tracey. As you can imagine the Parkes Club was thrilled to have the popular horse at a midweek meeting, and you can bet connections of his three rivals still talk about the night they clashed with Our Sir Vancelot. Few Miracle Miles have gone by without some sort of headline grabbing controversy. The 1997 edition was perhaps the most sensational of all when the Kiwi “boom horse” Christian Cullen was declared a non-starter not long before scheduled starting time. Our Sir Vancelot got caught outside the leader for more than 200 metres, before wresting the lead from stablemate Quantum Lobell in the back straight. He easily accounted for Quantum Lobell and Iraklis in 1.55.5. 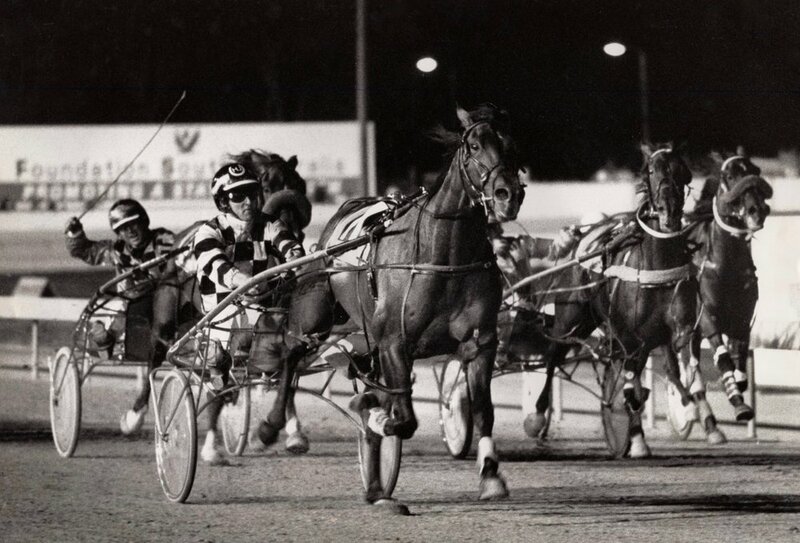 Image courtesy National Trotguide - With Brian Hancock under suspension, Howard snared the winning drive on Our Sir Vancelot 1997 Miracle Mile. All these years on Howard still marvels at the fact that he’s in the record books as the driver of Miracle Mile and Inter Dom winners - both times through unexpected circumstances surrounding the legendary Brian Hancock. Howard retired from his engineering role at Shellharbour Council 6 years ago and is now fully occupied in the harness racing sport. He still prefers to train a small number, with only three horses in work currently. Veteran gelding Mortenson is still competitive in his class and may well add to his record of ten wins and twenty two placings. Howard is putting plenty of time into a yearling gelding by Caribbean Blaster and also has a three year old trotting filly called Meghan Trainor who should be at the trials in a month. He puts in a few hours most days with his old friend Brian Hancock. “Brian still has enough horses around him to require a little help”, said Howard. “His nephew Darren sends a constant flow of pre trainers over, and the legend still likes to break in an odd one”. He recently retired the eleven year old trotter Cyclone Dream, who bowed out with a record of twelve wins and forty two placings for a prize money tally of $124,000. Cyclone Dream was raced by Howard’s long time partner Maxine Cranney, who is always first on the scene whenever help is needed. I happened to overhear a comment from a spectator one night at Menangle as Howard took Cyclone Dream onto the track. “See that bloke driving Cyclone Dream”, said the stranger. “He has driven a Miracle Mile winner and an Inter Dominion winner”. When you think about it, that’s pretty hard to top!